Painting landscapes, coastline and skies can be achieved in a range of artist’s mediums; watercolour, acrylic, oil paints, pastels, etc. I learned the techniques of traditional oil painting from my father, Fred Adams, an accomplished artist and art expert. From the age of ten years old I began to learn about the methods of the Old Masters and today I very much follow this school of art. The traditional techniques of oil painting vary dependent upon the school or method. In the classical school oil paintings built up in several layers. The canvas is properly prepared and each layer is subsequently added. Some layers are allowed to dry fully before the next is applied. At other times the layers are subtly combined as the paint is worked ‘wet-in-wet’. Oil paints are used because of the specific characteristics they have. The pigments (that produce the actual colour) are combined with oil, often linseed oil but also safflower oil, walnut oil, etc. Oil paints also produce some of the deepest and richest colours, from deep darks, through subtle greys, to intense and vibrant highlights. Colours are dependent upon the quality of the pigments used. I normally work with with oil paints from Winsor & Newton (Artist Grade) and Sennelier of Paris (Superior Grade). This paint is then mixed further with other mediums and materials, such as Damar varnish, various resins, some to extend the paint, some to speed up the drying time. Sometimes very thin layers of transparent paint are applied, known as glazing. This allows colours beneath to show through and create depth. Opaque paint can be added on top of this (dried) layer, a technique known as scumbling. The techniques of glazing and scumbling were used by many great and Old Masters, and in particular Turner was known for this style of oil painting. Oil paint is a chosen medium for artists seeking the finest tonal gradation. Allowing us to blend one tonal value, and colour, into another. Producing the finest tones possible. Painting in oils also produces a strong tonal range, with the darkest darks through to the brilliant highlights. And oil painting is often created from dark-to-light, the opposite to watercolour painting, where the paper produces the lights and darks are added successively. Oil paints are also one of the most robust forms of art medium. Oil paints dry through a process of oxidisation (not evaporation, as is often thought). This means layers of paint can form a strong and long-lasting surface. With care and common sense an oil painting can last for many years and certainly outlive the artist and owner. NB. An oil painting with multiple layers may take many months to fully dry, sometimes even a year or more. Please note, commissioning an artwork using these traditional techniques takes time. Commissioned works normally take between 3 – 6 months to complete. Very few colours are truly 100% colour-fast. However oil paints are very effective at retaining their original colours. Modern pigments and oil paints are far more stable and superior to those used by the Old Masters, many of whose paintings still survive today, some several hundreds of years old. The final layer applied is often the varnish. Although today, with less air pollution and better materials, some artists choose not to varnish. I do prefer to varnish all paintings for added protection. Normally with a satin finish, although works can be varnished to choice with either gloss or matte. The vast majority of my artworks are produced on stretched canvas. With smaller pieced on canvas panels. 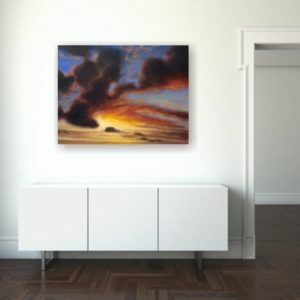 Stretched canvas is presented on a wooden frame – the stretcher – with the canvas material stretched across the frame and tacked or stapled at the rear. The canvas is normally cotton, linen or even hemp. I do not use nylon or other synthetic ‘canvases’. This material has then been sized – a coat of sealant or glue is used to prepare the material for the next layer. Gesso is a white medium similar to Plaster-of-Paris but more flexible. This can be built up in several layers. The thickness of the gesso layers determine how smooth the canvas surface will be. For example, in fine portrait painting the artist needs a very smooth surface. It is said that painting on polished copper creates the finest portraits! However, as with many artists, I like to paint with the ‘tooth’ of the canvas and use this to create texture and accent highlights. Close up images show how the tooth brings out this effect. Most of my oil paintings are produced on proprietary canvases. As with the other materials I use, I only choose quality canvases with solid stretchers. For commissioned works I can offer paintings on handmade canvases to (almost) any size. These can be produced in the finest quality Irish Linen. My oil paintings are offered, and priced, here on this website as unframed works. I do undertake (or arrange) framing at the client’s request and can discuss personal choice, the planned setting for the work, and advise on a wide range of framing options and costs. Some paintings are produced on deep-edge canvases, or box-framed. These are suitable for hanging without framing. Normally the edges are left white but these can be painted black, or even gold or copper. This creates a stunning and contemporary visual effect. Frames can be traditional or contemporary and are totally a matter of personal choice – a frame should always be matched to the painting. Frames can also include a ‘reveal’, which is a small space between the canvas and the frame, giving the impression that the artwork is floating in the frame. It is not necessary to use glass when framing oil paintings and generally I would not recommend this, unless for very special reasons. Where will the painting be displayed? – Is it light and naturally well-lit, or is it darker, with artificial lighting? Where will the painting be viewed from? – This is critical. The visual effect of an oil painting has an optimum viewing distance. In general, the larger the painting, the further away it should be viewed from. What is the best size for the painting? – Measure the space you are thinking about, please don’t guess and allow for framing too. What colours will compliment the setting? – Does your room or space have any specific colour palette you want to reflect? What do you like? – This may sound obvious but always buy a painting because you like it, if it does increase in value, well done! And finally, please note – all images on this site have been produced to provide the most accurate representation of the works for sale or hire. Your computer screen may not accurately display the colours as they actually appear. If you are unsure about colours please ask, as I am able to supply hard-copy photographic samples for reference. Also, please note that some images (such as the interior settings) may not show the painting to the actual scale. These images are for presentation only. If you have any questions about my artworks, how these original oil paintings are produced, or if you have any specific requirements, please contact me personally. I would be very pleased to help you. More information on my artworks can be found throughout this website.